Texas Biker Radio - TBR News Comment - Waco - video reviewed by The Associated Press showed on Wednesday. WACO — As gunfire broke out in the parking lot of a Texas restaurant, dozens of motorcycle riders ran inside seeking cover and tried to guide others to safety, security video reviewed exclusively by The Associated Press showed Wednesday. 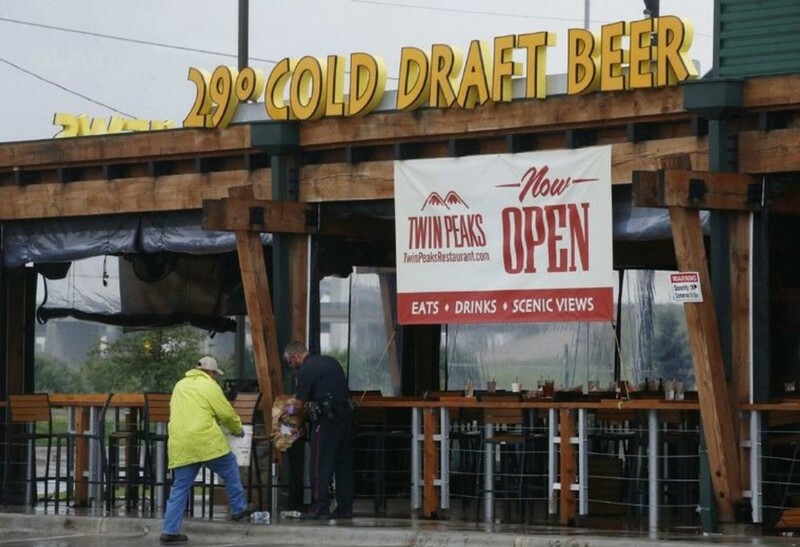 The video suggests that Sunday's deadly gunfight began outside the Twin Peaks restaurant, except for one round fired by a biker on the patio who then ran inside. When gunfire begins at 12:24 p.m., most bikers, other patrons and staff immediately run away from the windows and into the restaurant's interior. At least three people can be seen holding handguns. Only one angle, taken from inside a back office in the restaurant, had audio. At 12:24 p.m., a woman is heard screaming, "Oh my God!" That's followed by multiple cries of "Get back!" Two minutes later, three gunshots are heard. It's not clear who fired. Authorities on Sunday swept up around 170 bikers who descended on the restaurant. Among those arrested was Theron Rhoten, who had just pulled into the parking lot on his vintage Harley chopper when the bullets started flying. "He's good to his family," she said. "He doesn't drink. He doesn't do drugs. He doesn't party. He's just got a passion for motorcycles." Police have said that all those arrested were part of criminal motorcycle gangs, but only two of the nine people killed had criminal histories in Texas. The eight members of Theron Rhoten's group, the Vise Grip Club, specialize in building and riding vintage and antique motorcycles, particularly pre-1970 Harley Davidson big twin choppers, according to spokesman Brian Buscemi. Buscemi said the bimonthly meetings have been happening for 18 years. "Yes, there was a problem at this scene, and it was absolutely horrific," he said. "But there just also happened to be a significant amount of people there who had nothing to do with it."